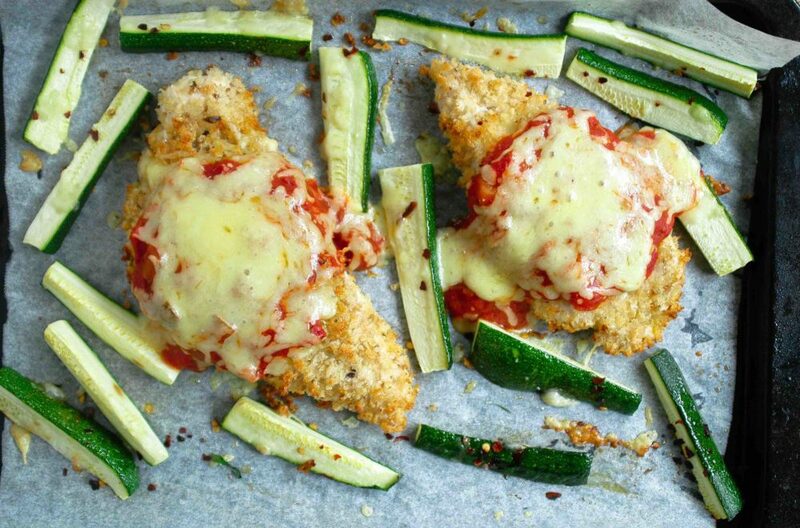 The pub chicken parmigiana is a bit of an institution in Australia and even has weekly nights devoted to its name, but unfortunately it doesn’t make for the healthiest dinner. Not only is the chicken deep fried and then slathered in a mound of melted cheese, in most cases it’s also accompanied by half a plateful of chips. Tastes good sure, but not exactly good for you. My healthy version uses fresh wholemeal breadcrumbs, is baked in the oven instead of being deep fried and ditches the chips. But in case that sounds like a whole lot less fun, don’t worry – you still get the crispy breaded chicken combined with delicious tomato sauce and melted cheese (just a little less of it!). Plus, it’s extremely easy to make and can all be done in the oven in less than half an hour (and you don’t have to go out to the pub to get it!). Bash chicken with a rolling pin or meat mallet until around 2cm in thickness, then cut in half lengthwise. Crack egg into a shallow bowl and beat lightly. Spread breadcrumbs over a large plate and combine with lemon zest and salt. Dip chicken breast pieces into egg and turn to coat. Then transfer to breadcrumbs, coating evenly on both sides (you may need to press them in a little so that they stick). Place chicken breast pieces onto a large oven tray lined with baking paper and spray tops with olive oil spray. Bake for 10 minutes. 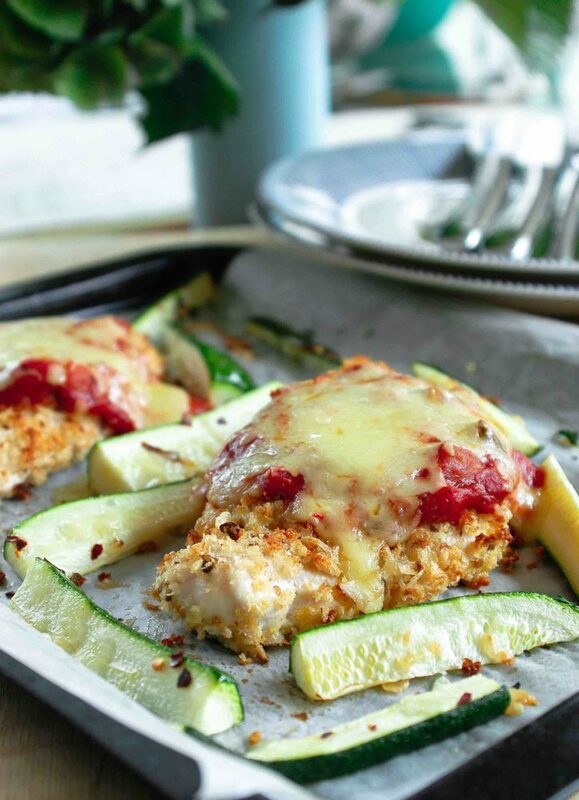 Remove tray from oven and arrange zucchini sticks around chicken, seasoning with chilli flakes. Bake for a further 5 minutes. Top chicken pieces with tomato sauce, spreading evenly over centre third. Sprinkle mozzarella cheese over tomato sauce. 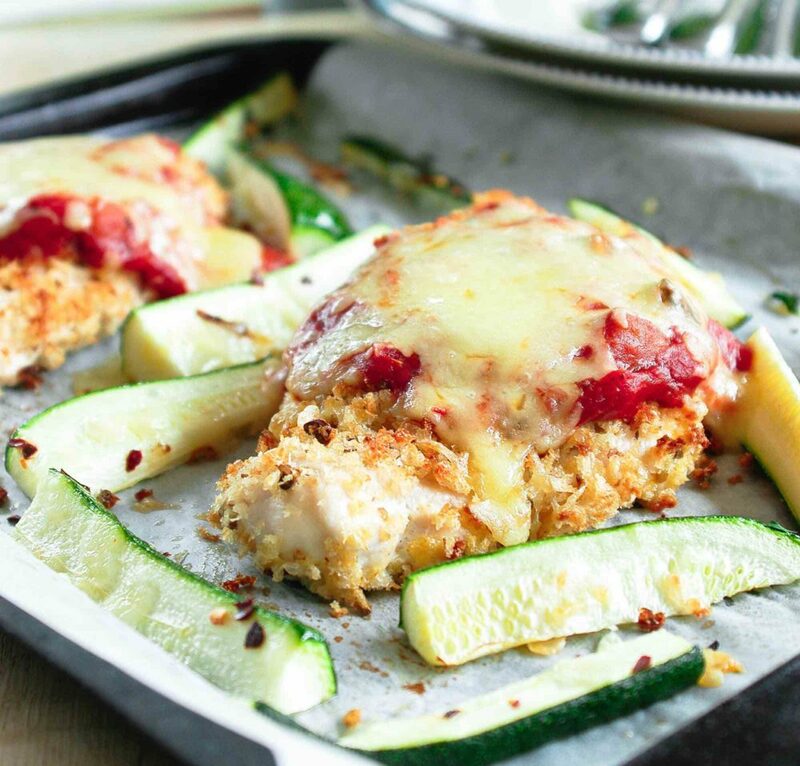 Return to oven for 5 minutes or until cheese is melted and chicken is cooked through.